Apache Junction lies at the far end of the extensive suburbia east of Phoenix, adjoining Mesa and Gilbert; the main thoroughfare is US 60, the Superstition Freeway, which provides easy travel from downtown Phoenix, I-10 and Phoenix Sky Harbor Airport (30 miles). The town center is a few blocks north of US 60 along the Apache Trail, a famous highway that leaves Apache Junction to the northeast and enters the rugged Superstition Mountains, which dominate the horizon to the east. The road eventually becomes unpaved, and reaches Theodore Roosevelt Lake after 44 miles, passing several other scenic lakes along the way. 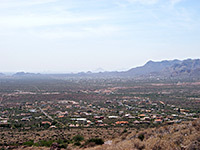 The town contains a typical mix of residences, business premises and shops, the main commercial area being along the Apache Trail corridor, and the junction with Hwy 88. Much of the district is quite lightly developed, with patches of empty desert between the built-up areas. 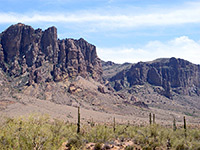 Other points of interest nearby include Lost Dutchman State Park (5 miles), featuring hiking trails through the Superstition Mountain foothills, and Boyce Thompson Arboretum State Park (28 miles) which has an extensive collection of plants, from Arizona, the US and across the world. Built in the traditional Southwest adobe style, the Best Western Apache Junction Inn sits close to the east edge of the greater Phoenix area, just 3 miles from the start of the saguaro-filled Sonoran Desert and the Superstition Mountains. The 40 room hotel is built on the south side of Apache Trail (1101 west), 0.25 miles east of Ironwood Road and close to various shops and restaurants including Fry's Supermarket; the scenic, desert part of the Apache Trail begins one mile east. The Best Western is clean and quiet, with average amenities of free continental breakfast, an outdoor pool and a hot tub. Lodging is quite limited in Apache Junction; many more choices can be found in Mesa and Tempe, a few miles west. Motel 6 Apache Junction sits next to the Superstition Freeway (US 60, Idaho Road exit) on the south side of the city close to the edge of open desert and about 6 miles from hiking trails into the Superstition Mountains, starting at Lost Dutchman State Park or Gold Canyon. Also at the freeway exit is one restaurant, but no other facilities; most area shops are between 2 and 3 miles north. The motel has two floors, interior corridors, a bbq area, an outdoor pool and a hot tub. Wi-fi is complimentary. Rooms contain a microwave and refrigerator.